Gravity is at work here. A body as massive as a planet or large moon has sufficient gravity to pull its solid rock, liquid oceans, and gaseous atmosphere into the shape of a sphere. Any hills or mountains sticking up above that “equipotential surface” eventually slump down under gravity until they are at the same gravitational potential as their neighboring particles of matter. In other words, gravity is stronger than the strength of the rock, over time. Smaller bodies like asteroids lack the mass—and thus the gravity—to pull their rocky surfaces into a spherical shape. The rocks resist the weak gravitational tug and retain the lumpy-looking, potato or dumbbell shapes we see in asteroid photos from spacecraft or Earth-based radar observations. 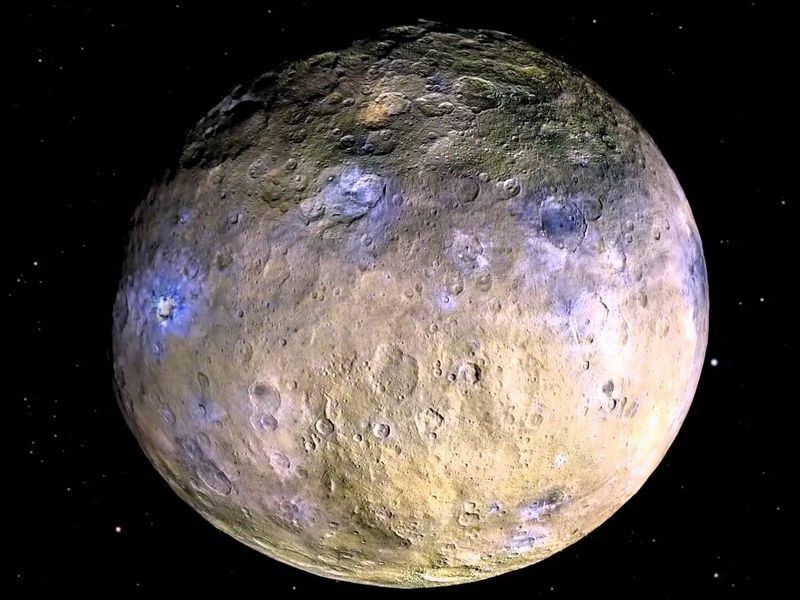 As an example, dwarf planet Ceres is just about spherical with a diameter of 950 km (590 miles). Asteroid Vesta is 525 km (326 miles) in diameter; its gravity is too weak to drag its egg-like profile into a spherical shape.